Today my guest is Steve Piatz. Steve is the 2008 Mead Maker of the Year and also the author of the book The Complete Guide to Mead Making (Amazon affiliate link). We start with a brief update of some of Steve’s mead making activities since his last podcast. Steve explains what a “session mead” is and how it is different than other types of mead. We discuss sweet vs dry finish, and agree that most meads need some sweetness (i.e are not best totally dry) or spices to balance them. We talk about a variety of methods for finishing a mead sweet including cold crashing, halting fermentation through filtration and backsweetening. Steve explains applying potassium sulfite and sulfate at the end of fermentation and also how to backsweeten. 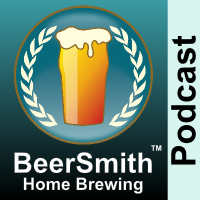 We discuss methods for adding fruit, spices, hops and other flavors, including why it is best to blend these in at the end. He speaks for a few minutes at the end about his book on mead making (link above). When you’re talking about session Meads and stopping the fermentation you never mentioned putting the Mead in a bottle after it’s been carbonated in a keg and then give the bottle a hundred and eighty degree water bath to pasteurize the Mead and kill the yeast that way.